Senior portrait sessions can take place ANY season of year. Yes, any time! While a great majority of seniors choose to schedule their photoshoot during popular seasons such as summer or fall, I love capturing senior portraits during other times of the year too! Advanced planning is essential when you choose to hold your senior portrait shoot during the spring of your junior year (or senior year!) and it’s a must for winter shoots because of weather. That may sound intimidating, but I still encourage seniors to consider these options. Why? Because the number one thing seniors say when they choose me for their photographer is that they want something unique and different. Choosing a less popular time of year is an easy way to achieve that! If summer or fall is still your favorite after reading this blog post, don’t worry! We can still certainly capture something special that you’ll love looking at for years to come. 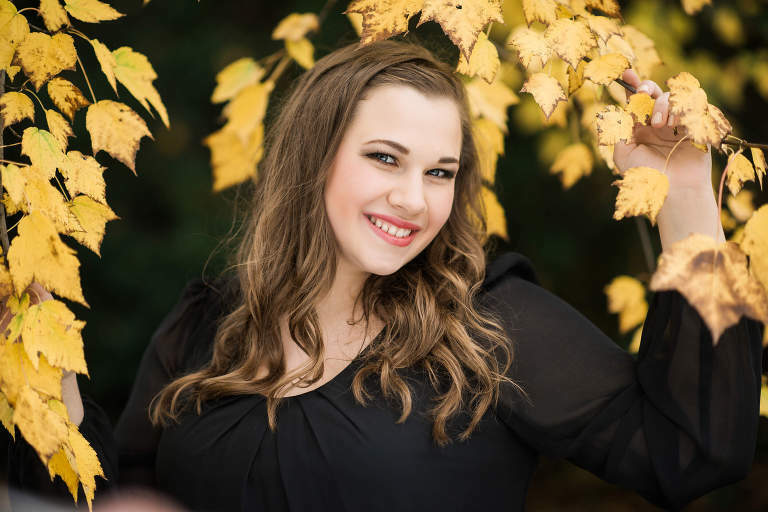 A quick note about yearbook deadlines and scheduling your senior portrait session: most schools have required submission deadlines sometime in late fall or early winter of your senior year. I encourage seniors to plan accordingly and schedule their senior session at least two weeks before your deadline so that we have enough time between your portrait session and your submission deadline to hold your ordering appointment. If you have your heart set on winter portraits for your senior session, many seniors choose to do our mini session add-on. This allows you to have TWO different sessions at different times of year. We hold one session earlier in the year and use those images as selections for the yearbook, and one session later in winter. It’s pretty easy! Now for the fun part! Here’s a look at what you can expect for your senior portrait session for each time of year. Spring sessions are wonderful because everything is beautiful, green, and blooming! And the flowering spring trees in early May or gorgeous! I recommend spring sessions in late April through mid May of your JUNIOR year . Yes, that’s early, but then you have your senior portraits DONE! That’s one less thing to think about as you start your senior year, which is always good! I’ve had a few seniors who will come back the end of their senior year for a mini session for prom or during the spring blooming season. This is such a fun way to wrap up your last year of high school! Summer portraits are the most popular time for many seniors because your school and activity calendar tends to be a bit more flexible. The huge advantage for summer is that there is an abundance of daylight! However, it can be very hot. For this reason, I schedule all of our summer sessions either early in the morning, or late afternoon and into the evening. And that means sunset photos and gorgeous glowy light! You’ll love it! A few things to consider for summer – if you’re hoping for wild flowers, then choose early summer, preferably June. Sadly, by August, most wild flowers have fried in the sun and don’t look very pretty. Occasionally we will get lucky and find a few wildflower fields and can fake it. However, the most gorgeous time for flowers is definitely June. If you want your senior portraits to feature water, summer is definitely best for temperature. We will need to make sure we shoot at a time when your location isn’t crowded with tons of people. Fall sessions might be my favorite – all those colors! Plus, the temperatures have cooled off a bit, and you’re finally in the midst of the excitement of your senior year! It is impossible to predict when peak fall color will occur, but we recommend the last few days of September and the first 3 weeks of October. Fall dates are incredibly popular for seniors, families, and weddings. Photographers refer to this as our busy season for a reason – these dates book FAST and early. If you have your heart set on fall portraits, contact me for your session ASAP! You might be surprised that yes, I do shoot senior portraits OUTSIDE in the winter! And they are incredibly fun! Many seniors want something unique, and this is certainly a way to achieve it. Because my calendar is more flexible during the winter months, we can wait for the perfect snow and then go for it! Or, you can schedule your session for a specific day. If it’s that gross muddy in-between-snow-fall kind of day, we’ll reschedule if you desire. It may be difficult to imagine what to wear for a winter shoot or how it will look. But it’s no different than planning for any other time of year, other than that I recommend more layers! Many seniors choose to add on a winter mini-session for fun, and I love doing that! Whatever season of the year you choose for your senior portraits, I know you will have an amazing experience! We will plan out your outfits and locations so that you can achieve the exact look you are going for! If you have questions about when to hold your senior session, or want to check and see if I’m available for your desired time, make sure you contact me!